Nokia will adopt Windows Mobile as its main smartphone platform in a wide-ranging agreement with Microsoft. But it's not as wide-ranging as it might have been: the two giants won't formalise the relationship by forming a joint venture or spin-out, and there's no mention of exclusivity on any of the many areas touched on by the announcement. 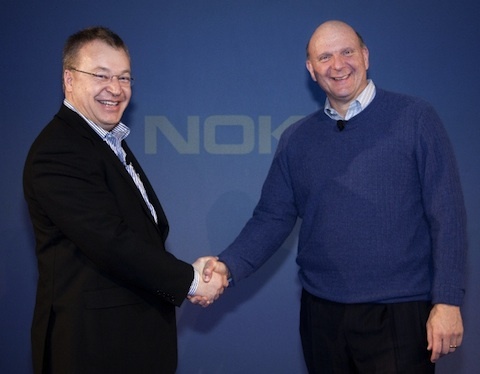 Nokia also announced a company reorganisation and the departure of the executive in charge of Meego, Alberto Torres. New CEO Stephen Elop, who joined Nokia from Microsoft, has made fewer changes to the Executive Board than many expected, and restructured Nokia into two: a smart devices and mobile phone division, from April 1. In a related statement, Nokia declined to give an earnings forecast for the year for its phones business, describing 2011 and 2012 as years of "transition". Nokia will elaborate on the announcement at a media event in London this morning. Which of these men looks happier to you? "Nokia will adopt Windows Phone as its primary smartphone strategy, innovating on top of the platform in areas such as imaging, where Nokia is a market leader," said the company in a statement, while helping to "drive and define the future of Windows Phone." The two promised to work on roadmaps and joint marketing. Nokia will gain Microsofts software development tools (there's no mention of Qt). Nokia promised to use Bing, and Microsoft to use Nokia's Maps for location services. "Nokia will contribute its expertise on hardware design, language support, and help bring Windows Phone to a larger range of price points, market segments and geographies," we learn. Elop promised to "disrupt" other smartphone ecosystems and urged his company to act swiftly. "With Nokia's planned move to Windows Phone as its primary smartphone platform, Symbian becomes a franchise platform, leveraging previous investments to harvest additional value. This strategy recognizes the opportunity to retain and transition the installed base of 200 million Symbian owners. Nokia expects to sell approximately 150 million more Symbian devices in the years to come." "Under the new strategy, MeeGo becomes an open-source, mobile operating system project. MeeGo will place increased emphasis on longer-term market exploration of next-generation devices, platforms and user experiences. Nokia still plans to ship a MeeGo-related product later this year." With the demotion of MeeGo from "platform" to "project", and Torres' surprise departure, we can draw our own conclusion. Symbian was created largely through Nokia's instigation, because Nokia feared Microsoft doing to phone manufacturers what it had done to the profit margins of the PC builders - and also, as Charles Davies described here recently, because Nokia thought it could do something better for cheaper than the $55-per-device royalty Microsoft wanted for Windows CE license. Bill Gates took the news of Nokia's rejection badly, you may recall. The deal is a coup for Microsoft. Is it good for Nokia? "I remember when Palm tried to build its future on Windows Mobile, and gave up in disgust a couple of years later when Microsoft licensed Palm's innovations to other phone companies. How would Nokia restrain Microsoft from doing the same thing again?" he wonders. The company reorganisation, and the accompanying Board changes are minimal, leaving in place many of the executives associated with the years of failure - at least for now. Tero Ojanpera will continue as "acting" head of services, which isn't the strongest vote of confidence. Son of former Finnish President Marko Ahtisaari, Marko Ahtisaari, survives as design guru. Mary McDowell and Niklas Savandr retain their places on the exec board. This is short of the "DeFinnistration" reported at the weekend.